We offer years of experience in roofing, waterproofing, painting and specialised coatings. The director of the company is John, he has more than 35 years in the roofing, waterproofing, painting and specialised coatings industry in UK, Africa and New Zealand. John also offers a consultantcy service to clients who require his services. Honesty, Integrity & Service – is something which you can rely upon at all times. Roofing & Waterproofing Ltd has a philosophy of quality workmanship and service, combined with quality products. We are a fully insured company and are Site Safe Members, as well as being Council approved contractors. We offer a full company workmanship guarantee including the product manufacturers warranty. We are accredited applicators of Noxide (Rust-Oleum Industrial Coatings), all Ardex Waterproofing Products, Kevlar, Duram, Gripset and Davco. We closely follow all manufacturers recommendations and specifications on our applications and installations. Roofing & Waterproofing Ltd are well equipped to take on the big jobs. – We have two petrol-driven 4,000psi waterblasters 80m of high pressure hose with an output of 15 litres a minute. 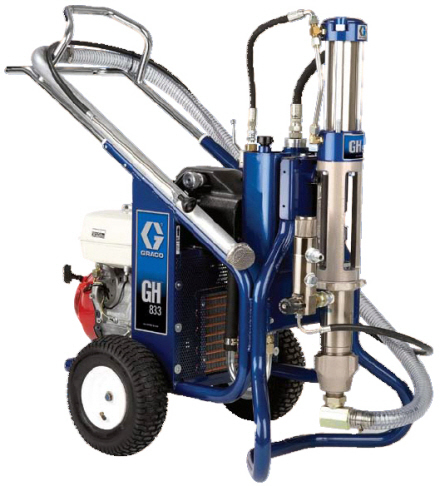 – we have the petrol-driven Graco Airless GH833 sprayer, which is the hydraulic model with 100m of hose that can handle two guns if required.